Combine the corn syrup, butter, vanilla and salt in the bowl of an electric mixer. Beat it together until smooth. Add the powdered sugar in 6 parts, mixing gently between each addition. Once combined, mix the sugar mixture until creamy. Reserve roughly two-thirds of your sugar mixture, placing the rest into a small bowl. Add the yellow and red food coloring to the small batch and mix well. 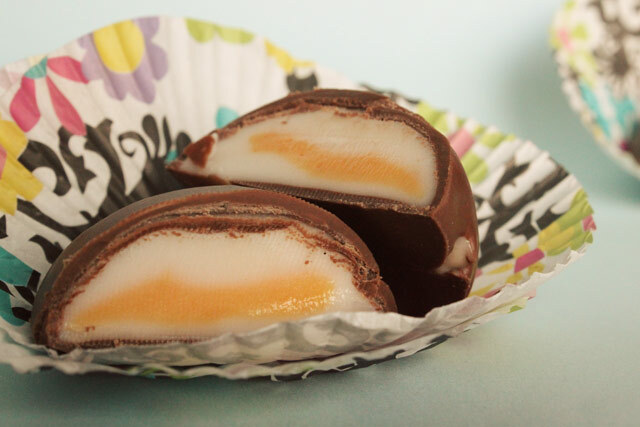 You’re after the unnatural and oh-so-unique orange-y color of the “yolk” from a Cadbury Cream Egg. Cover both mixtures and chill until they’re firm, around 2 hours or until you just can’t wait any longer. I think I waited for around 45 minutes and mine came out fine. Pull a bit of the chilled orange-y mixture (this will get messy) and shape it into a ball about the size of a marble. Continue until the orange mixture is gone, placing the marbles on a wax-papered and greased cookie sheet as you go. TIP: This mixture is tricky to work with. It likes to be very creamy and melty at room temperatures—part of the reason those Cadbury eggs taste so good. You may want to work through shaping your marbles a few at a time, letting the shapes set in the freezer for 10-15 minutes in between. Once you’ve shaped all of your yolks, take them one at a time and wrap a small amount of the un-colored white filling around each one by creating a “disc” shape to wrap around each orange yolk. Mold it into an egg shape, then place each egg on a papered and greased cookie sheet. Let your eggs chill for another 2 to 4 hours, checking on them periodically until nearly solid. If you find your eggs are starting to look more like flat blobs, it’s OK to re-shape them and let them chill longer (like, ahem, I did). Melt the chocolate chips and shortening together in a double boiler or ceramic bowl until thin enough to dip into (If you need to make your chocolate mixture thinner, add more shortening). Dip each of your chilled, hardened egg shapes into the melted chocolate, taking care to cover them on all sides. Place each one back onto your cookie sheet until you’ve coated all your eggs. Place them back into the fridge to chill until the chocolate is set, around 2 hours.